Michael flung the door open and stood there beaming in his brand new floral print shirt .Time froze for a moment as the shirt drew the gaze and awe of the room's inhabitants. As the group regained composure, a bunch of fellas made their way over to Michael to brandish praise, "Nice shirt mate" said one. "Woah,looking fine", said another. One shy lad at the back of the group piped up, "Where did you find such a wonder, sir?" The group fell silent once again as a proud grin grew from ear to ear on Michael's face. He bowed his neck forward, then raised the collar to reveal the four letter tag which spelled out the word 'ASOS'. ASOS is a global fashion destination for 20 somethings. Having launched in 2000, it now sells over 85,000 branded and own brand product to customers all over the globe. Due to their ever presence in youth culture, ASOS decided to create an unforgettable festival experience for the folks at Way Out West festival in Gothenburg, Sweden. Way Out West is a hugely popular music festival featuring rock, electronic and hip-hop artists. The 2016 line-up included the likes of Morrissey, Sia, Chvrches, Massive Attack along with a seemingly endless list of music superstars. Droves of towering electric blue-eyed Swedes braved torrents of rain and mud to throw mean dance shapes at the three-day music party. Over in the pumping ASOS tent, festival attendees were invited to jump in front of the branded photo booth to create their picture perfect festival memory. They then received a print out of the photo to treasure forever. An additional copy of the photo was printed with a coloured border. There were 10 different coloured borders, which all had a specific home on a pixel wall display that sat outside the tent. 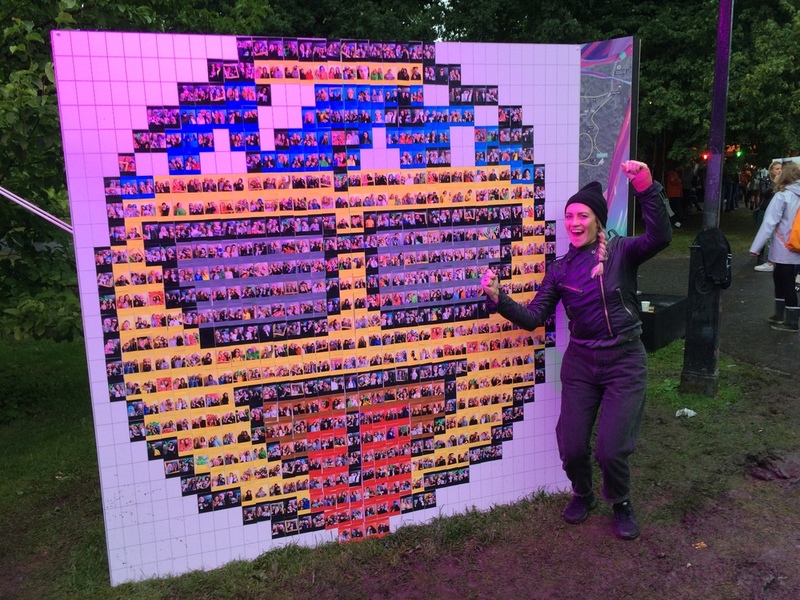 Three days and 1,500 photos later, the combined images made up two incredible festival emoticons where festival goers could come back and check for their photo and relive everybody’s festival memories. The ASOS emoticon concept was coordinated and executed by events agency Event Concept and Photographic brand experience agency #HASHTAG.